With this Supernatural Goldtone Anti-Possession Symbol Pocket Watch, you can ward off evil demonic spirits and tell time at the same time! 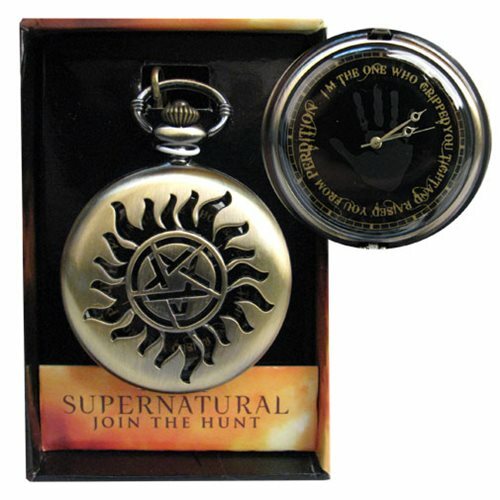 This goldtone pocket watch features the anti-possession tattoo that Sam and Dean Winchester sport on their chest. Open the pocket watch with a press of the top release to allow the cover to open. Watch measures approximately 4-inches wide x 3-inches tall x 2 3/4-inches long. The chain measures approximately 15-inches long and the watch comes packaged in a displayable box. Ages 14 and up.